OKLAHOMA CITY, Okla. — A New York-based Satanist group has released photographs of its sculpted ‘homage to Satan,’ which it seeks to place next to a Ten Commandments monument on the grounds of the Oklahoma state capitol building. As previously reported, the Satanic Temple issued a news release about its intentions last December, outlining that the placement of the display may resolve the dispute over the Ten Commandments monument, which is currently the subject of a federal lawsuit. The six-foot display was erected in 2012, but the ACLU said that the monument was unconstitutional. Although the application had not yet been approved, Greave’s organization proceeded to launch an indiegogo fundraising campaign, which raised over $28,000 for the creation of the monument. 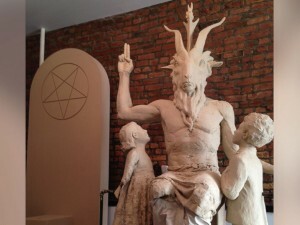 This week, the Satanic Temple released photographs of the sculpture, which features the goat-headed figure Baphomet making the sign for the occult, as children fixate their eyes upon him on both sides. Off to the side stands what will be a throne for Satan, engraved with a pentagram overhead. However, some state that the proposed “homage to Satan” is offensive to Oklahoma residents. No official decisions will be made on the proposal until a ruling is issued in the Ten Commandments case.